Forza Motorsport is reality, and Forza Horizon is fantasy. Forza Motorsport is the science of driving and tuning, and the simulation of tires on asphalt. It's real racetracks, scanned with lasers to ensure to-the-inch simulation. Forza Motorsport is something like real racing – at least the moment-to-moment aspect of driving cars fast on hard asphalt. Forza Horizon is what you imagine owning a sweet car would be like when you're old enough to want to drive, but not old enough to be able to yet. It's the fantasy that companies like Ferrari and Lamborghini do their best to keep alive in order to continue making and selling beautiful cars with no practical application. 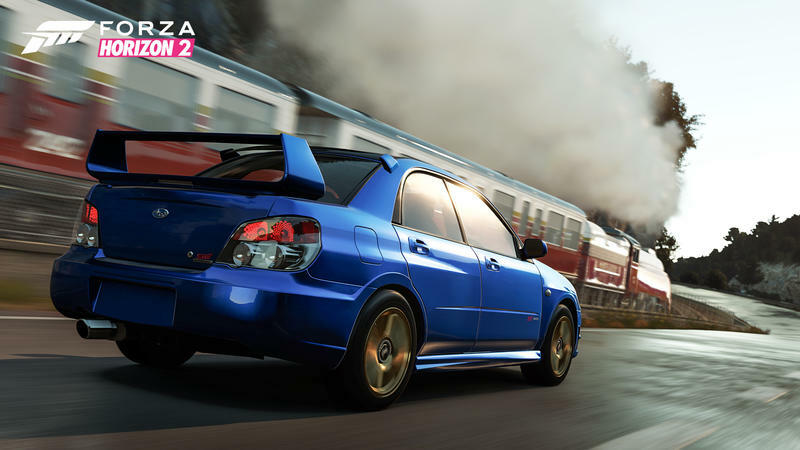 Forza Horizon is wind and speed and all the fun of driving with none of the real danger. When Forza Horizon branched off from Forza Motorsport a few years back, I was initially suspicious, only to be pleasantly surprised by how well the simple core fun of driving and racing translated to an open world setting. So, can Playground Games do it again? Forza Horizon takes a couple of the core tenets of its older sibling and runs in a new direction with them – driving and cars. To make the driving mechanics work in an open world setting, Playground had to make some concessions. In the less-tightly controlled world of Forza Horizon where narrow tracks give way instead to wide open spaces, it was necessary for the team to cut the frame rate down from 60 to 30 frames per second. If you follow gaming news from the last year, this might sound like sacrilege. If you're extremely sensitive to framerates, you might be able to tell the difference, too. It doesn't, however, have a substantial effect on the quality of driving, which is still both tight and highly tunable to match your driving preferences. The most experienced Forza drivers will able to tell, but most of the difference lies in the open-world setting and the way you and the drivatars act within it. The core driving feels great at any given moment, but some elements of the game's design hamper it. Like Forza Motorsport 5, Forza Horizon 2 is built on the idea that you should be able to drive any car on any track at anytime. Go anywhere, do anything. If suffers, as a result, from one of my biggest issues with last year's Forza Motorsport iteration. While the driving is incredibly fun, some of the fun of progression is drained by too much freedom. As you progress, you pick up different colored wristbands meant to signify how far up the ladder you've advanced. In the original Horizon, those wristbands were obtained by beating boss characters, drivers you had to defeat on the track to move forward. They were sometimes frustrating gates, but at the same time, finally taking them down was satisfying. The only reason to participate in the racing series is "because it's there." I felt no real sense of satisfaction or advancement on playing through the races beyond simply enjoying the driving. I have a couple gripes, apropos of nothing, that are worth mentioning. The first is a simple technical matter: Forza Horizon 2 is a bit unstable right now. During the 30+ hours I spent playing it, I had it hard lock on me twice. Even worse, though, was that more than a few times, I had trouble resuming a suspended game. At least four times, I would attempt to resume a game only to find myself stuck in an endless loading screen. We're not talking "make a sandwich" length, but literally endless. I ended up having to give my Xbox a hard reboot more than once to get back into the game. And then there's also the matter of the drivers. Not the drivatars – the player-harvested intelligence that operates the vehicles – but the drivers themselves. Every single driver is the same brown haired white guy. He looks like Nathan Drake from the Uncharted series. He's the same guy, and he's always expressionless. Whether you're just cruising along a coastal highway in your Lotus Eleven or mid-flip as your Corvette Stingray takes an off-kilter hill in the worst way possible, he's always expressionless, completely bored with the rare, expensive hypercar he's driving. It's like the Stepford Wives of racing games. The problem of him being in every car is exacerbated by what is actually a pretty fun optional mechanic. To generate some extra credits, you can take pictures of cars in the game. Every new car model you photograph will net you some extra credits, and every twentieth will get you a big bonus. With Forza's robust photo mode, this is a great way to show off the cars and environments designed by Turn 10 Studios and Playground Games. As I tracked down different cars, I would sometimes spend minutes framing a shot just right, tinkering with things like the camera aperture and shutter speed to get just the right look. I got creative doing it, but, having that same boring dude in every car forced me to get even more creative as I did everything I could to hide his blank face from my camera's lens. With so many different character models roaming around Forza Horizon and his model doing so little, it's surprising Playground Games didn't give players the option to customize their character and that they didn't randomize the models occupying the many cars you'll run into. It gets pretty weird when you're trying to take a picture of two cars, trading paint and bending metal, when the angle you want shows two clones battling it out. For extra fun, you could layer a whole science fiction story on top of this. Your character is a clone in some weird, deadly future sport, except you're the one who woke up. Unlike the others, you have time travel, so you can rewind your meaningless deaths over and over to stay alive, but you remember the thousands of deadly crashes you've been in. This weird detail isn't the kind of thing that affects the game from moment to moment, but it ate away at me as I played and took away from the overall experience. One element that's unquestionably been improved, though, is the multiplayer. Online free-roam, sorely missed in the first Horizon, is present. The more directed Online Road Trip experience is fun as well. You and a group of players vote on a location and drive to it, competing in an event. After four of these events, whoever has the most points wins. You get a great mix of direct competition – including the single player's various race types and some multiplayer focused stuff like Infected mode – and those down moments between events where you're driving to the next location. Those down moments still let you build up more points by getting there fast without making it a race for first place. Events like the aforementioned Infected mode take place at isolated zones, like an airfield, a warehouse area, and a seaport, that give you all sorts of fun, unrealistically laid out things to jump off of. They're a part of the game's greater world without being an eyesore. Forza has become a consistent go-to series for me, and the Horizon branch is no different from the Motorsport branch in that respect. I enjoyed the time I had with it, though you'll want to walk in knowing what you're getting. Playground Games brags about there being 168 events, each with its own set of 4 races. The truth is that the variations from race to race are mild. As you travel across France and Italy participating in these events, you'll see that the same car groupings at each location. It's a bit like bragging about how much food your buffet has instead of how many options or how good the options are. All the same, I stuffed myself at the buffet and had a great time doing it. Forza Horizon 2 is a great looking game. The southern European setting is gorgeous and provides a variety of roads and settings to race on. The presentation is slick all the way through, and the six radio stations ensure you'll always have something to listen to (even if they aren't quite as stellar as those in the first Horizon, which I still listen to regularly). Thanks to a solid, entertaining core, the less-than-perfect progression and the boring dude sitting behind every steering wheel don't take away from the game enough that I regret my time with it. Disclaimer: We received final retail code from Microsoft to download and review Forza Horizon 2. We played 33 hours across all modes, including completing the solo campaign.